Opinion Although commentators have not made anything of it, I have been disappointed that Advantage Six declined to exhibit at this Autumn's RISC OS events in Guildford and Birmingham. Following the shenanigans of the summer, and their failure to attend the shows, I worried that Ad6's Stuart Tyrrell and Matt Edgar might have decided to invest their time and money outside of the RISC OS arena. The stock on their stand at Wakefield must have represented an investment of around �50000 and to be prevented from catching the follow up trade over the next couple of months must have been more than just irritating. Given that, it is understandable that they were wary of committing themselves further at that moment, well in advance of the Autumn show dates, at which they had to make a decision. However, Advantage Six have shown that they've not been idle during their no show. If the team are not willing to come to the shows to demonstrate their wares then I guess it's down to drobe.co.uk to go to them. This is exactly what happened on Wednesday night. Following a visit to the dentist in the afternoon, I set off from Shrewsbury for Manchester and Finnybank Road, home of Qercus magazine and the monthly meeting place for the North West User Group. The lure was a first public demonstration of the work in progress on a range of ground-breaking machines, running RISC OS on modern native hardware, collectively referred to as the A9s. Details of the A9s, and the philosophy surrounding their development, emerged in this month's Archive magazine, in an informative three page article by editor Paul Beverley. 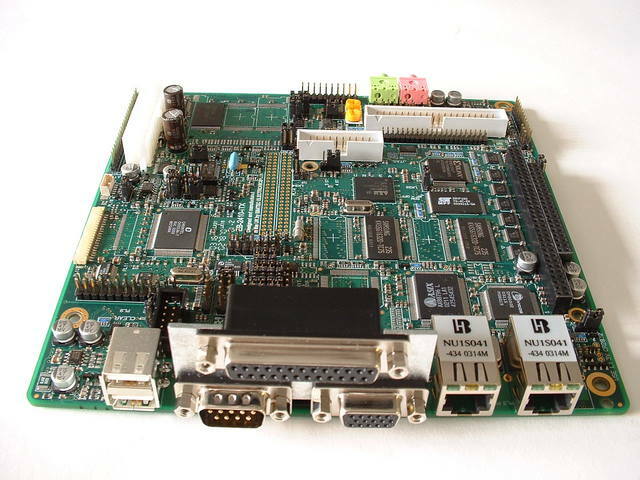 Annoyingly, for us desktop users, there is rather too much talk about embedded applications, when what we really want is more range and more choice regarding proper, fully formed and functional RISC OS machines. Don't get me wrong, there would be little point in Advantage Six competing with Castle by producing an Iyonix priced and Iyonix specified machine, and they won't. The target has to be one or two of the many gaping holes and potential markets for which there is no current RISC OS offering. I shall, inevitably, drift back shortly to the question, "What springs to your mind when asked where the potential markets lie from the desktop user's point of view ?" First, we must look at the A9s because the question is only worth dwelling upon here in the light of the hardware now on the horizon, and the directions in which it can be pushed over the coming year or two. It has to be said, right at the start, that Stuart Tyrrell and Matt Edgar are a great team and that they presented their work with great humour and style; they bounce banter to and fro in a relaxed and friendly manner whilst keeping each other in check if the questioning is leading either of them down a path that they are not yet free to talk about. The demonstration very much placed the audience in the position of a curious but critical and questioning executive director of some massive company. In his office - and you've only got ten minutes kids, because I'm luncheoning with the wife at 1pm sharp - a couple of sparky undergraduates are showing off a box of tricks that is, actually, pure genius. They want you to buy thousands of it. You know they've got something. They know they've got something. But what they are really selling is a dream and a future. You'd show them the door and mutter "pie in the sky" were it not for that god-dam thing on the desk in front of you that does such amazing things. Sure, it's a cobbled together bit of electronics, with wires hanging out the back from wobbling sockets, but it works. It's got potential. It reminded me so much of the stories of the meeting in which Acorn demonstrated what become the BBC Micro to the BBC, having managed to get the graphics chip working the night before. This is what leading edge technology is all about. It's great fun and it's exciting. These guys are living on the front line but they are for real and you just know that, well, 62% chance: they could make it big. At least, that's the impression I got. The demonstration A9 that I saw is delightfully small, and presented in a smart stylish black metal, silver fronted, case. It was "spindle free": no floppy drive, no hard drive, no CD ROM or DVD and no cooling fan. A range of applications were accessible from a solid state (Flash) ROM disc, such as Zap and the ArtWorks viewer. It was running a 32 bit version of the Adjust operating system about which I quizzed Stuart and Matt carefully. The modular nature of RISC OS 4 has made it possible to prioritise which parts of the operating system get developed first, and at each stage have a working system. Indeed, if a particular embedded product does not require parts of the OS this process can be reversed. Sections can then be fairly easily removed, thus providing elegant, succinct, compact code, tailored to the task at hand. All the while though, development is drifting towards an ever more fully developed Adjust 32, that at some point will enable an A9 to exist free of the tag "embedded". Additional work would be needed to widen this non-embedded Adjust-32 so that it works on Iyonix as well as A9s and, possibly, even RiscPCs: there is no point limiting your potential market unnecessarily, and the rumours of a super-fast (times 60 speed increase) Draw may yet breathe life into old machines as well as turbo-boost the new. As things stand with the A9s, only a resolution of 640 by 512 is supported, the mouse pointer is but a single pixel black dot, and pressing F12 scrolls the screen to reveal a view of random RAM contents: "There is no VIDC chip in the A9s", explained Matt, "and the part of the OS to emulate in firmware, the scrolling that used to be done in hardware, has yet to be written". Stuart and Matt had arrived at the hall with the demonstration A9 packaged in a single laptop bag and a large 17" monitor in its cardboard box. They had brought batteries with them because it had been unclear if the hall would have accessible mains power. Mains power there was and so the batteries were not needed. They set up and had a running system within five minutes, the principle glitch being a lot of button pushing on the LCD monitor to fit the display correctly to the screen. If this is not screaming "portable RISC OS", what is? Is "portable" one of the target markets currently not serviced by RISC OS that an A9 could be positioned for? Advantage Six refused to comment. Firstly, they, themselves, have no wish to market and push a new RISC OS machine be it desktop, laptop, or something in between. They want to focus on what they are good at, which is being the folks to which another player, a dealer familiar to RISC OS users, will come and say "build me an A9home machine to these specifications". One of the most exciting aspects of these A9s is the fact that they are not being built around a single central processor unit, but for a range of such devices. And here is the key issue: that range is still under development. Rumours suggest that we could be talking well in excess of 1GHz. The A9 in front of us was running at a speed that Stuart refused to describe in any way other than "mid-200Hz". Trying to get around his coyness I asked Matt what was the fastest he'd ever seen RISC OS clocked at, regardless of if it were a practical proposition or not. No comment. Even so, this does rather raise an issue that is going to be difficult for a third party distributor to get right: Speed versus Cost. I can see that there is a pull to market something slower yet cheaper than the Iyonix, that will close the vast gulf facing someone who's using Virtual Acorn RiscPC and liking it, but not willing to jump all the way to Iyonix. On the other hand, I'm actually quite fed up about not having a flagship machine that I can wave at my PC fixated friends and say, "Look at this; stylish, good looking, and bloody fast". But would you, could you, pay, say, �2600 for a 1.8GHz RISC OS laptop: Not that that is necessarily even a possible option, but it makes you think about the terrible dilemma that someone is, allegedly, interested to resolving and then backing financially. It'll be very, very interesting to see what, if anything, emerges from all of this over the next few months. Enough of the idle speculation. Stuart invited me to play around with the A9 and challenged me to crash it. Using the Artworks viewer the famous apple displayed very briskly in around two and a half seconds. The Whales (from Vol 9, Issue 3 of Acorn Publisher) displayed way, way faster than on a StrongARM RiscPC. There did not seem an awful lot to do so I tried vigorously resizing the ArtWorks apple three times in a row. Crash. The machine froze and out came Matt's PC laptop to download the data concerning the A9's final moments. It was all handled with very good humour and is, actually, no big deal at this stage. I do worry a little about bugs creeping into RISC OS as it continues to grow up, and evolve. I started typing out this article as plain text in !Edit on an Adjust ROMed Kinetic RiscPC. I soon had to stop as bits of text started disappearing and reappearing in odd positions and the cursor deleted and inserted text other than at its on-screen position. Over to a StrongARM and then Iyonix. The same problem on all three machines: perhaps I'd corrupted the file saved to disc in some way. I dragged it into TextEase and finished without incident. Then, to scan in the photographs, I had to disable my Viewfinder card, as mine has turned out to be incompatible with Adjust when I start working heavily with sprites (or colouring objects in Draw). None of these are big problems but they are irritations in recent, supposedly, finished and polished products. It was a big effort to attend the meeting. It took over two hours to drive each way, not helped by ridiculously large quantities of crazy cones spread around the crucial three exits from the M60. I'm really glad I went. I had a most entertaining evening in the company of kind and thoughtful RISC OS enthusiasts and came away feeling inspired. "Yes", RISC OS has a future, and "yes", there are plentiful markets to play for, and expand into. None of us really know where the technical roller-coaster ride that the human race is on is taking us, but it is great that the part of it that we know a lot about, and care about, is hanging on in there and growing strong. Oh yes, one final piece of news: Advantage Six are intending to be at Wakefield 2005. "Big time", says Stuart. What a clear and informative piece. It keeps users on the other side of the world up with what is happening and helps to maintain the enthusiasm for our special machines. Well done. Thanks for a top article! It seems to have covered all my niggling curiousities! A great article. As for a two hours drive down under, no probs, drive that to the shops! Actually how many kms was that? No Floppy, CD ROM etc., so would something like a (USB) Transcend JetFlash (portable storage device) be one means of data transfer/storage? The case looks very nice, if that is the 17" monitor (as the article says) in that photo, then the case must be quite compact? Looks and sounds impressive, well done Stuart & team. I've been doing some light investigation. It's late, so forgive me if I'm wrong. Has anyone else noticed that the back of the A9 looks a lot like the back of Simtec's ARM9 dev board? In which case, it's a Samsung 2410 evaluation board, with a 266Mhz ARM920T SoC. Ok, so the PDA dev board runs WinCE. But STD's board seemingly runs Adjust32. I could be completely off base here, but just what I've found from some random googling. The back of the A9 looks like the back of the Simtec's ARM9 dev board, but is not the same. What do you need on the board: VGA connector, parallel/serial, USB and Ethernet: If you put the big connector in the middle, you can put the USB to the left or you can put the USB to the right, so that's 50% change. Plus, the A9 has an other connector (keyboard?) so they look the same, but they are not. If you look at [link] you see a connector on the same place, but other stuff not. Similar design, but not the same. I didn't make it and I only live down the road I fell asleep as soon as I got home on Wednedsay. And have to get through those cones every day to work. Nice to see a report of it, judging by this article the A9 sounds like a very promising development indeed. Sorry I missed the meeting - haven't been for a while - since the meeting day changed. The Arm 9 is being used in a number of items. A non- Risc OS one being Tapwares Zodiac 2 an 'entertainment console' for 330 UKPs. It's described in Computer Shopper Issue 204 (Feb 05) p26 as 'a combination of a games console, Palm-based organiser and media player. It has a 3,8in screen 128 Mb Ram Bluetooth, IR and two SD memory slots - I wonder if it could softload Risc OS? DaveC: "haven't been for a while - since the meeting day changed"
What colour depth was the 640 x 512 screen mode? Am I correct in saying that it was not using the project Simon acceleration? In reply to CJE You are correct: it was not using project SIMON. (I asked) It was in 256 colours, which someone there suggested might, actually, be slower than, say, a 32 thousand colour mode. (Something to do with 256 being emulated ?) But the part of Adjust-32e to display 32 thousand colours is not in place yet. In rely to Chris I also asked who designed and who made the circuit boards to which the cryptic reply was, "A range of sources". I was thinking 'Simtec' but they stonewalled on that one. In reply to DaveC: "haven't been for a while - since the meeting day changed"
Well perhaps I should have said after it changed I could only get there odd times. It might be a couple of years now. With regards the back of the A9, both Matt and Stuart were keen to point out that the final design has not been finalised yet so theres every possibility that what you see now is not what actually appears when it goes into full production. RISC OS cracking team in top 100. To the OGR mobile!